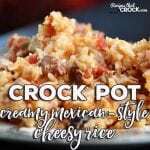 This Creamy Mexican Style Crock Pot Cheesy Rice is going to kick your next taco Tuesday or family fiesta up a notch for sure! Everyone will be saying, “Olé”! The first time you make this, watch it closely! This is rice in a slow cooker folks, timing can vary greatly from one crock pot to another...even ones that are the same brand and same size. If you don't watch it closely the first time you make it, you are likely to end up with crunchy or mushy rice...and nobody wants that. I know fix it and forget it recipes are awesome, but when you are dealing with rice, I don't recommend it. Giving your rice dishes a good stir every once in awhile when they are crockin' will protect you from any hot or cool spots your slow cooker might have. The last hour or so, check it frequently. Rice can go from perfection to mush in a half hour or less. So again, the first time you make it, you need to be able to keep an eye on it.